Love the tee...and the maxi looks great on you! Love that Damier....it goes anywhere!!! Love your black dress, you look stunning! The Miu Miu bag and the black maxi are gorge on you! And your pup is adorable! 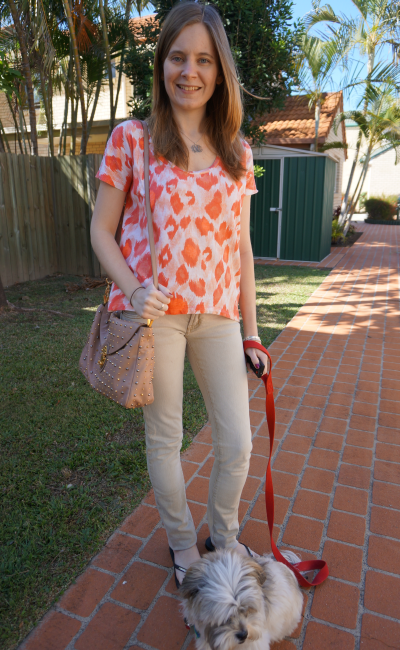 I love the fresh colour pop of the tangerine blouse - it certainly brightens up the mood! And that casual maxi is such a perfect road trip dress ... or even for long plane trips! So effortlessly chic. 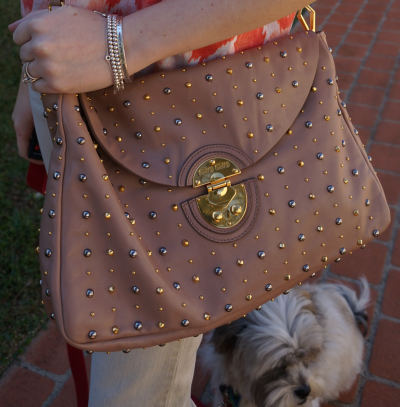 Loving the Miu Miu bag. So funny but the episode of SITC is on and it is about them buying fake bags in LA haha I have never bought a fake bag. Haha! I accidentally bought a fake bag on ebay once as I thought it was real :( Was an education for me! I'm much more careful now. No-one wants to buy fakes and support criminals. Oh that black dress is wonderful!! The maxi dress is perfect for a road trip! Enjoy your weekend! Great outfits! that top looks great on you! And that miu miu bag is adorable! Maxi dresses are definitely one of my go to pieces to wear when I go on road-trips, they are so easy but you still look put together. Hope you had a fun trip! That maxi dress is so flattering on you! I love the sunglasses with it! 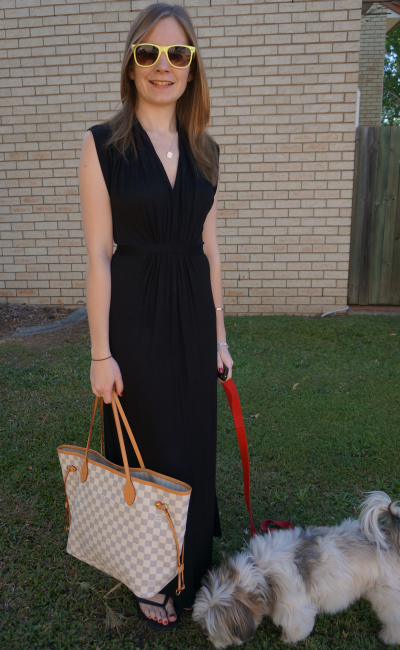 you look divine in the black maxi! So sophisticated and elegant Mica! Wishing you a great week ahead! Loving that Sass + Bide tee! So pretty! Ok, now this explains everything. I didn't read blogs over the weekend. You guys looked like you had an awesome time! I checked my FB this weekend. Trips away are always so nice. That maxi dress was perfect Mica. Thank you all so much for your kind comments. We had a lovely roadtrip and a great long weekend! Your Miu Miu bag is out of this world !! i had not seen it before - i adore it!!!! and you looks spectacular in that long black frock and tote - you look so chic.